Large Dumpsters that can be rolled into place off the back of a truck are called Roll-Off Containers. They are not constricted by a lid which makes them ideal for customers with large volumes of waste. Bulky waste such as construction debris, scrap metal, glass, concrete, and wooden crates or pallets are ideal for placement in these types of dumpsters. Green City Waste is the Top Roll-Off Container Service in Denver, Colorado. Clean-up of large areas such as a yard, garage or basement. 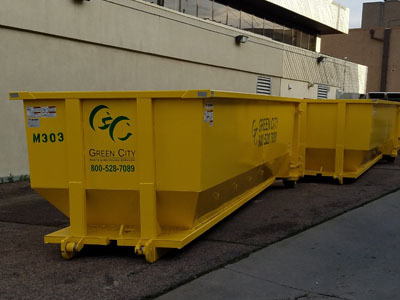 Green City Waste & Recycling has a wide range of roll-off containers in their inventory. The containers come in various sizes that are excellent for providing flexible use. Responsive scheduling that accommodate for fluctuating volumes can also be provided. 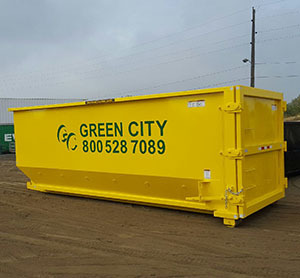 Whether you need the container for only one day or for continued use over many years, contact Green City Waste & Recycling to speak with a waste collection professional about receiving your container and service today. The dimensions and sizes of the roll-off container depend on the type of container issued. Feel free to utilize this information when ordering the size that you will need. Roll – Off Containers are categorized by approximate cubic yard capacity. Due to governing laws, certain materials cannot be accepted in roll-off containers. Those materials include: batteries, hazardous waste, liquids, paints, oils, medical waste, tires and appliances containing chlorofluorocarbons (CFCs). 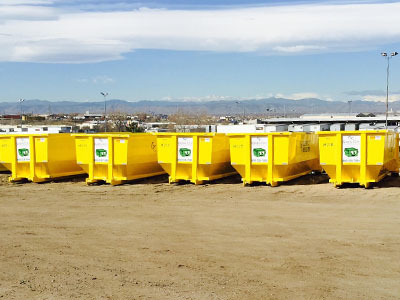 If you need some more information please check out this article about dumpster rentals in Denver. If you are looking to rent a Roll-Off Dumpster in the Denver area please contact us!